Online Monitor Stand Designed with Mount for 58" Flat Panel Monitor is a Work Horse! This Monitor Stand Will Last! Buy Online Today! Heavy duty TV stand designed for vertical mounting of television. 37"-60" monitor weighing up to 176 lbs. can be mounted on LCD rack. Heavy duty TV stand made of steel & ideal for trade show use. VESA compatible for 100mm x 100mm, 200mm x 100mm, 200mm x 200mm, 400mm x 200mm, 400mm x 300mm, 400mm x 400mm, 600mm x 400mm, 800mm x 200mm, & 800mm x 400mm. This heavy duty monitor stand that hold a 37"-60" LCD, plasma or LED TV weighing less than 176 lbs. 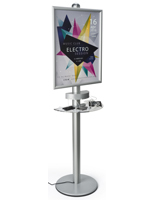 is used at trade shows and convention centers by various companies. Businesses use an array of media to promote goods and services to customers. The heavy duty monitor stand that is height adjustable allows LCD monitors to be positioned at an ideal level. The included tools make changing the height fast and simple. This classic TV media stand, heavy duty monitor stand with wheels has lockable casters for positioning the display furniture. These wheels lock to stabilize the unit once in a desired position. The heavy duty monitor stand that has wheels, like LCD display furniture, is designed to specifically to mount televisions in portrait orientation (vertically). In the related products field to the right there are classic racks that display televisions in landscape (horizontal) orientation, like those found in a living room. The classic LCD furniture, heavy duty monitor stand is VESA for 100mm x 100mm to 600mm x 400mm and supports many brands of televisions including Sony and LG. 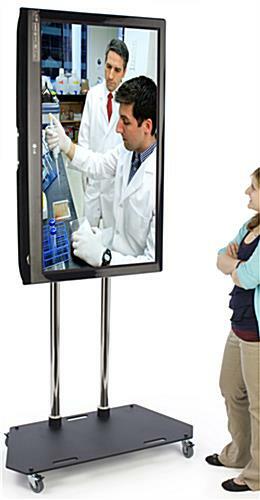 The long arms of this display will stick out on some televisions, especially if mounted in vertical position. The monitor stand designed for 58" monitors has a tilt bracket for angling your TV for a good viewing angle, similar to residential LCD furniture for a living room. The entire display ships unassembled. Tools and instructions are included for fast assembly, like many of the living room television stands! MonitorStandsNow.com is where to buy these monitor stands for 58" wide screen TVs wholesale!